Red lentils are perfect for plant-based weeknight dishes. They are hulled and split, which means they cook up fast. In this soup, they are cooked with vegetables and seasoned with cumin and smoked paprika to highlight their earthy flavor. Use your favorite fruity olive oil to garnish this soup as a nice contrast to the smoky flavor and hearty texture. Note: Smoked paprika is a Spanish staple. Look for pimentòn ahumado in specialty food stores, spice shops, Spanish food stores, or buy online here. Pick over the lentils—pulling out and discarding anything that isn't a lentil (bits of grit or even small rocks can sometimes make it into bags of lentils). Put them in a sieve and rinse them with cool running water until the water runs clear. Set aside. Peel and finely chop the onion. Trim and finely chop the celery. Trim, peel, and finely chop the carrot. (Note: It's more important to chop this onion-celery-carrot mixture evenly so they all cook at the same rate than finely so they all cook quickly since the soup gets puréed.) Peel and mince the garlic. In a large pot over medium-high heat, heat the olive oil. When the oil is hot, add the onion, celery, carrot, and salt. Cook, stirring frequently, until the vegetables are soft, about 5 minutes. Add the garlic and cook until fragrant, about 1 minute. Add the cumin and paprika, cook, stirring constantly until fragrant, about 1 minute. Add the rinsed lentils and 6 cups of broth or water. Bring to a boil, then reduce the heat to maintain a steady simmer. Cook until the lentils are soft and falling apart, about 20 minutes. Use a large spoon to skim off and discard any foam that forms on the surface of the soup. Add up to 2 cups additional broth or water if the soup seems too thick. 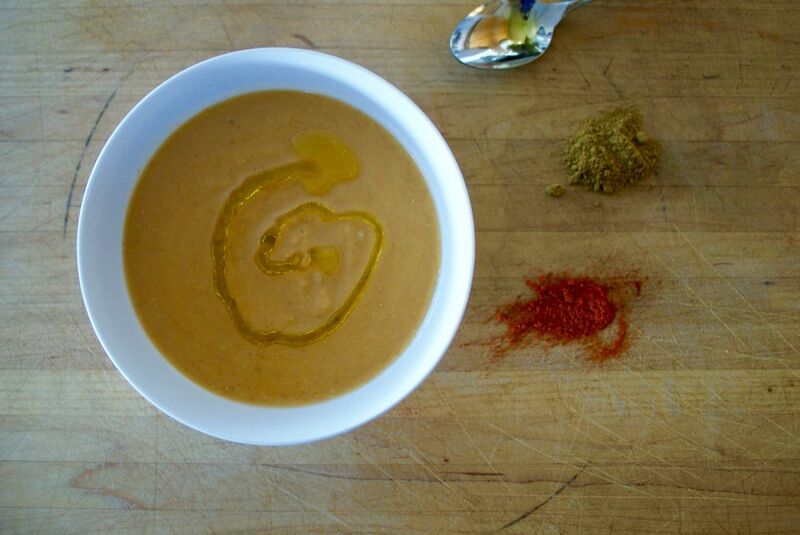 Use a hand-held blender to purée the soup. Or, whirl the soup in batches in a blender or food processor (cover the top with a kitchen towel to avoid potential burns). However you purée it, make sure to do so thoroughly, so the soup is truly smooth. Add water to thin, if needed. Season to taste with salt. Serve hot with a swirl of extra virgin olive oil, if you like.